The GVE370-2 George is the ultimate all-in-1 cleaner in the Numatic Homecare range. It provides dry vacuuming, wet vacuuming and wet scrubbing features. Whatever you want - dry vacuuming, wet vacuuming, scrubbing and drying hard floors, deep cleaning the carpet, cleaning the upholstery, unblocking the sink - you name it, George is your man. George sports the highly efficient 1200W bypass Twinflo motor plus the powerflo' pump system for pumping cleaning fluids into the wet cleaner. For dry cleaning George comes with the new Hepaflo dustbags and big filters, plus a superb combination floor nozzle. The George design is in itself based entirely on the Cleantec professional range of machines; designed to work extensively and for long hours and functioning to a professional standard. Charles is normally supplied with Numatic "Accessory Kit A26A". The A26A kit metal components are made of stainless steel. When buying your George all-in-1 cleaner you want to make sure you find a good supplier. Online it can be difficult to know which suppliers you can trust but I have found, to my surprise, that Amazon sell other things beside as books. What's more they have some of the best vacuum cleaner prices and provide the security of buying from a well known and trusted company. So I have included a George product link to Amazon on this site which displays their current price. And remember, with Amazon delivery is included in the price shown. 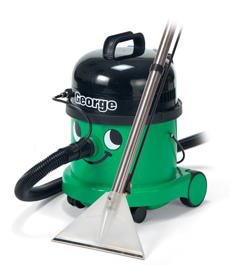 Simply click on the link to purchase your very own George wet and dry Vacuum Cleaner.